I had a pretty good idea when I picked this up it wasn't going to suit me. I hate bigging myself up but I am relatively lucky that I can wear most shades of lipstick but this one just seemed that bit too orange. In fact, I think the photo below, although unfiltered and in natural light actually plays down the orange in it because it is quite stark. So free lipstick from MAC. How? If you're not familiar with 'Back to MAC' it is their worldwide recycling programme. But you have to work for that free lipstick girl. And by work I mean you have to finish up 6 MAC products which you then take back to any store and exchange for a free lipstick of your choice. Nearly all products are included in the recycling and MAC have a simple chart to show you if your six items qualify here. I have a fair few MAC lipsticks in my collection (if fair few equals almost 100) so choosing one I don't already own can be a bit challenging but So Chaud was one I had just never gotten around to buying but was one that was on my MAC lipsticks to buy wishlist that I store in my brain. It falls into the matte category but I found it to be incredibly comfortable and long lasting to wear. It pairs perfectly with MAC High Voltage lip liner. I felt like the shade was way more orange toned than Lady Danger for example which I think I can wear quite easily. 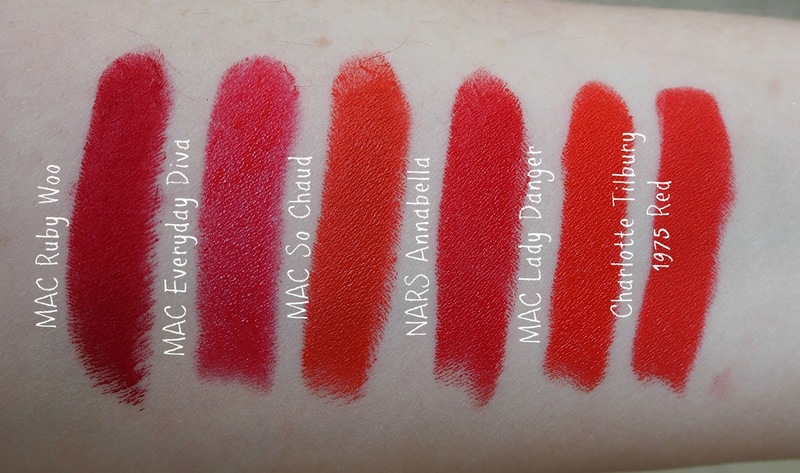 But when I started to pull a few lipsticks out of my stash and swatched them against So Chaud I really struggled to see a discernible difference-as you can see from my swatches below. But when I wore So Chaud I felt it was quite stark-maybe it was the rest of my make up, or the fact I am incredibly pale-but something wasn't working for me. All in all, great formula, long lasting and would suit a much more tanned complexion than mine. But if you're going to not fall in love with a lipstick shade, it may as well be a 'free' one!